The customer is the highest priority for Continental Refrigeration. Not do they provide superior customer service, but they also have an abundance of equipment models to fit your specific food service needs! Continental Refrigeration's keg coolers range in size from 24" to 90" in various depths. They offer a standard model with textured baked enamel finish. For a more advanced keg cooler, you can add front breathing technology, faucets to the right, dual and triple faucets, and a right-side compressor. 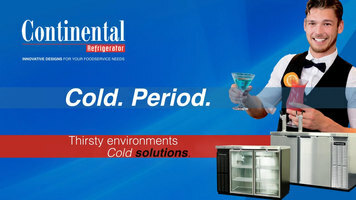 Continental Refrigeration's back bar coolers also range from 24" to 90" in various depths. Like the keg cooler, the back bar cooler is also available with front breathing technology. However, there are different additions that you can add. Depending on your preference, you may add sliding glass doors, hinged glass doors, a pass-thru, or a right-side compressor. 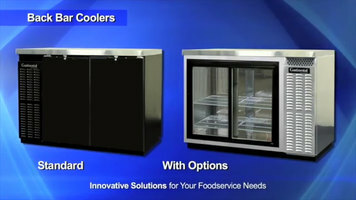 No matter what kind of cooler or appliance you are looking for, Continental Refrigeration is there to help! With over 2000 models of food service equipment, Continental Refrigeration is a top "solutions provider" for all businesses! From restaurants and bars to bakeries and delis, this American company can provide you with innovative appliances. Today, we're going to discuss the importance and the procedure of cleaning your condenser coil on your Continental refrigerator or freezer. This is important for many reasons. Firstly, it will conserve energy, cut down on your service costs, and also add life to your compressor. It's always important to disconnect the power to your cabinet before doing any preventive maintenance. The first thing you want to determine is where your condensing unit is located. It could be located on the top of the unit, at the rear of the unit, or on the front. Now what you want to do is located the condensing unit and remove the front grill. Once the grill is removed, you'll see the condensing unit and the condenser coil looks like the radiator in your car and inspect for any dirt or paper. Using a stiff nylon brush, remove any debris in a downward motion and always go in the direction of the fins. Depending on the amount of dirt, you may also want to use a shop-vac and you can also pass a flashlight into the fins to see if you can see through or have any additional blockage. If everything looks good, reattach the grill and start your unit. If further information is needed, consult the operation manual on our website at www.continentalrefrigerator.com. Conserve energy and cut down on service costs by cleaning the condenser coil on your Continental refrigerator or freezer! This will extend the life of your compressor and keep it running properly. 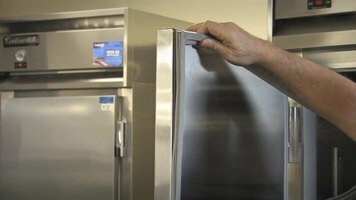 In this segment, we're going to discuss the care and the steps needed to replace the door gasket on your Continental refrigerator or freezer. It's very important to maintain your gaskets. On a regular basis, they should be inspected for any wear or tear on the sides or on the top. If needed to clean your gasket, use mild soap with warm water and a soft-bristle brush. If a door gasket is required, contact the factory or your supplier with the model and serial number of the case and that'll determine exactly the part number and the gasket needed. No tools are required to replace the gasket. Grasp the top corner or the door gasket and pull straight out of the retainer. Once the gasket is fully removed from the door, take the new gasket and line up the dart on the gasket with the retainer. Pushing with your thumb, making sure that the dart is in line. Once the gasket is in place, close the door, inspect for any gaps or sealing issues, and that's all that is needed to replace a door gasket on your Continental refrigerator or freezer. If additional information is needed, consult the factory or the operation manual, which can be downloaded on www.continentalrefrigerator.com. Maintain the gaskets on your Continental refrigerator and freezers with these simple instructions! By inspecting the gaskets for wear and tear, you can ensure there are no gaps or sealing issues on your units. In this segment, we're going to discuss the installation of the optional electric condensate heater with thermostat to take the place of the non-electric condensate pan that comes standard with your equipment. Electric condensate heater may be needed in high humidity and heavily used applications. It is always important with any piece of Continental equipment that has an open pan opening, that pans be left in the top section at all times. If pans are removed at night and that space is left open, condensation will accumulate and the heat from the kitchen will be drawn into that area and that may be the cause of your excessive condensation. If the electric heater is needed, it's easily installed. Remove the rear back cover, two Phillips screws at the lower section, lift the cover, and set it to the side. It's always important to disconnect the power to any piece of equipment before doing any type of work. Once the rear cover is removed and the power is disconnected, take your electric heater and place it in the same non-electric condensate pan that comes with the unit. Have the heater loose, facing the rear. Place it in the pan and the plastic tubing, make sure it's directed into the pan. You may have to adjust the length of the tubing by trimming it down so the plastic is not touching the electric heating element as this will melt. There's a provision in the lower section and that condensing unit area where the condensing unit plugs into the receptacle. One side is marked condensing unit and one side is marked vaporizer. This would be plugged into the side that's marked vaporizer and the extra, additional cord, you can coil that up and use a wire tie or electrical tape so that it doesn't interfere with the fan, go below the bottom of the box, or lay in the pan. Once that is done and power has been checked, make sure everything is tight, make sure there's no vibrations, and you can reinstall the rear cover. Once the rear cover is reinstalled, you're ready to plug the case in and it's back in operation. 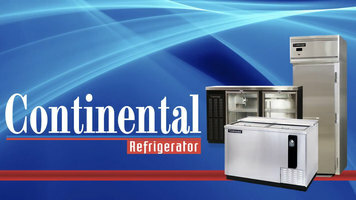 If additional information is needed, consult the operation manual or the website at www.continentalrefrigerator.com. Install your electric condensate heater within your Continental until by following these simple steps! An electric condensate heater is needed for heavily used applications and in high humidity areas. In this segment, we're going to discuss the calibration of your LED digital thermometer on your Continental refrigerator or freezer. It's always important to check the calibration before calling the factory or your supplier for service. This can easily be done by placing an accurate thermometer on the center shelf, closing the door for 10 minutes, and then comparing the inside to the outside. If the two numbers do not meet each other, figure out how many degrees you either need to go up or down and then calibration would be needed at this point. You would go to the top of the thermometer. Hit the right hand center, and you'll see CAL, which stands for calibrate. Hit it a second time and you'll see a number. If you need to increase the temperature on the thermometer, you would go to the upper left hand corner. To decrease, the lower left hand corner. Figure out how many degrees you need to change, push that the number of times, and go back over to the right until you see the desired number that corresponds to the inside. You may have to do this a few times to get it to the proper temperature and once that is achieved, let the temperature settle for another 10 minutes. Do a second check and if everything matches, calibration is complete.In this segment, we're going to discuss the calibration of your dial thermometer on your continental refrigerator or freezer, which is easily done with a small, slotted screwdriver. The most important thing is to make sure that the calibration is correct before you contact the factory or your supplier for any service. If service is need, there's a tag on the inner wall of the refrigerator or freezer with the model and serial number. First, place the thermometer on the center shelf if you know it's accurate and calibrated properly. Close the door and let the temperatures settle down for at least 10 minutes. Once that is achieved, you take the small screwdriver, put it under the bezel of the thermometer, and pry off. Once the cover's removed, take your slotted screwdriver, place it in the center screw of the thermometer, and turn it either to the right or to the left to make it colder or warmer. Once the thermometer is set to the proper temperature, let the box settle for another 10 minutes. If you're happy with the two readings, replace the thermometer bezel cover and you're complete. If additional information is needed, you can consult the website at www.continentalrefrigerator.com. Calibrate your digital or dial thermometer with these simple steps! Calibration will ensure a perfect internal temperature in your Continental refrigerator or freezer. Continental Refrigerator: Cold. Period. Thirst environments, Cold Solutions. KC Keg Coolers: Unique forced air design utilizes fans (approx. every 12") across the entire unit. Readily removable front, rear, and side venting louvers. Stainless steel reinforced threshold sills. Front breathing. Continuously cooled, 3" diameter beer columns with stainless steel lever faucet. Easily removable stainless steel drip tray. With optional features like a stainless steel exterior, towers on the right, dual or triple faucets, towers on the left, and a compressor on the right, you can get exactly what you want. There is the standard model, and you can add optional features to it. BBC Back Bar Coolers: Unique forced air design utilizes fans (approx. ever 12") across the entire unit. Readily removable front, rear, and side louvers. Stainless steel reinforced threshold sills. Front breathing. With optional features like a hinged glass door, sliding glass door, pass-thru, stainless steel exterior, and a compressor on the right, you can get exactly what you want. There is the standard model, and you can add optional features to it. Why is the location of a left or right side mounted condensing unit important? Consider your kitchen’s layout when choosing whether to have the condensing unit on the right or left side and pick the configuration that will keep the compressor as far from heat sources as possible. By ensuring that your unit’s compressor is farther away from equipment like undercounter dishwashers and hot food holding equipment, you can significantly extend the life of the unit. 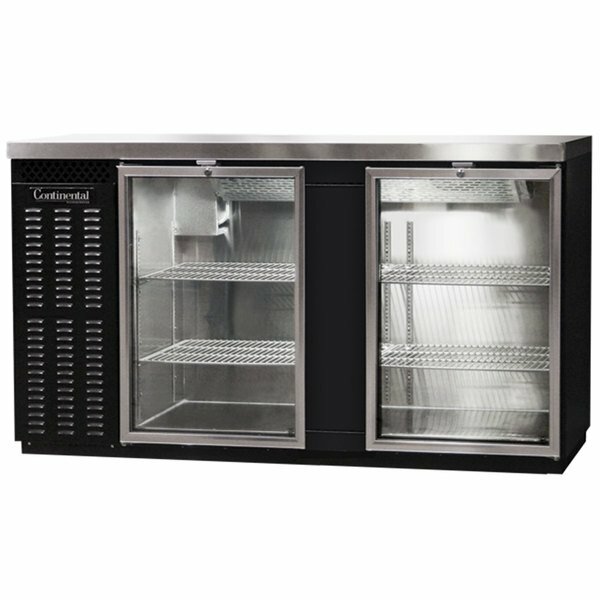 Great for use in medium-sized bars, this Continental Refrigerator BBC69S-GD 2 glass door back bar cooler delivers superior performance and plenty of refrigerated storage space for bottled and canned beverages, and even for 3 straight wall kegs! This 69" front-breathing unit features a shallow depth design so you have more room to maneuver behind the bar, a black vinyl-coated steel exterior to resist the wear and tear of everyday use, and a galvanized interior with reinforced steel floor to provide additional support for heavy loads of bottles, cans, and kegs. To make loading easy, it also boasts stainless steel reinforced threshold sills and 4 epoxy-coated shelves. 2 glass doors provide easy visibility of the inside and lock to prevent theft during off-hours. The unit's interior lighting also enhances product visibility so that your employees can offer fast service. Additional features include a 304 stainless steel countertop that resists corrosion, an extra-large evaporator coil for consistent product temperature and quick recovery, and a slide-out 1/3 hp condensing unit for easy cleaning and maintenance. This model also features Continental Refrigerator's automatic non-electric condensate removal system to help save energy. A 115V electrical connection is required for operation. This unit includes an electronic controller with digital display and hi-low alarm. This product can expose you to chemicals including Vinyl Chloride, which are known to the State of California to cause cancer, birth defects, or other reproductive harm. For more information, go to www.p65warnings.ca.gov. WARNING: This product can expose you to chemicals including Vinyl Chloride, which are known to the State of California to cause cancer, birth defects, or other reproductive harm. For more information, go to www.p65warnings.ca.gov. RESIDENTIAL USERS: Continental assumes no liability for parts or labor coverage for component failure or other damages resulting from installation in non-commercial or residential applications. The right is reserved to deny shipment for residential usage; if this occurs, you will be notified as soon as possible.